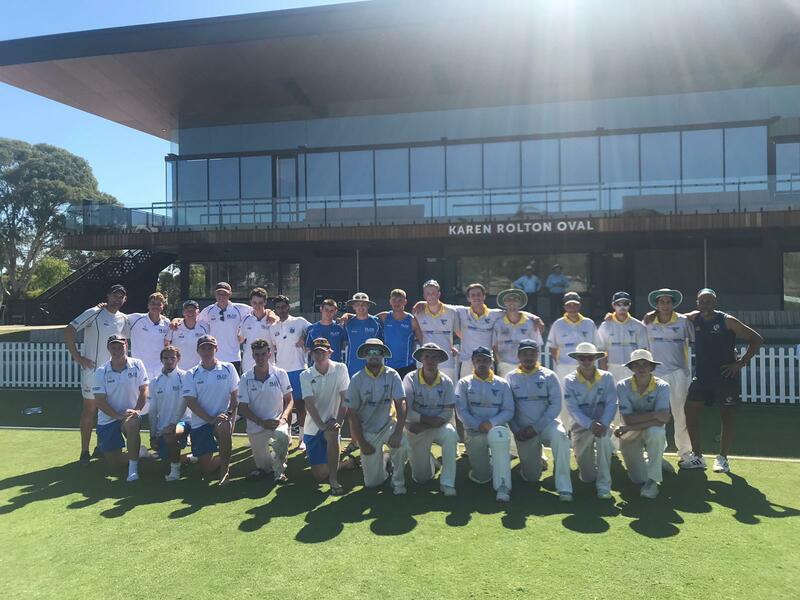 After months of preparation, the DLCA welcomed Da Future Stars to Adelaide for 4 days of actioned packed cricket. 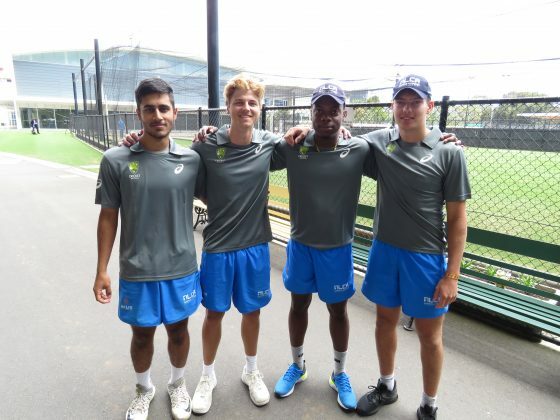 The academy from Melbourne engages predominantly local Australian players and were always sure to be a quality opposition in the T20 and three day fixture. After flight issues due to cancelled Tiger Airlines flights, Da Future Stars eventually arrived on Monday 22nd January in the morning. The stage was set for our first match of the week at Adelaide Uni sports fields, with a T20 to decide who had the best short form game. DLCA captain Raff Hussey won the toss in the T20, electing to bat. With Charles Clist and Kieran Grey opening the batting, the pair got off to a great start. Clist was punishing the bowler, smashing them all over the park. On 0-45 from four overs, the DLCA were looking promising, until Clist had a lapse in judgement and attempted a ramp shot to be eventually be bowled out for 34. Billy Buckingham and Murray Whitaker were next in and both struggled to get off the mark, as did Ned Dunning who was trapped LBW. Eventually Mahaaz Ahmed came to the crease and steadied the ship with a mature 34 from 37 balls. The DLCA were eventually bowled out for 8/110 from 20 overs. Da Future Stars started slowly, losing an early wicket for not many runs. Some tidy bowling from Billy Buckingham and Raff Hussey early set the stage for a close run chase. Unfortunately a few expensive overs in the middle of the game and a lack of concentration, saw the opposition get some quick runs and the target began to look in reach. After a fightback of two quick wickets from Mahaaz Ahmed, the game was in the balance. However, Da Future Stars ran way with the game in the last six overs and reached a comfortable winning total of 161. It was a great learning experience for the DLCA players with Head Coach Mark Harrity discussing the match post game. Following the match, all players went home and rested up ahead of the three day game. Arriving early on Tuesday 22nd January, both teams met for the coin toss at the prestigious Karen Rolton Oval. For those unaware, the oval is the premier ground in Adelaide behind Adelaide Oval and boasts great facilities. Ahmed lost the coin toss for the DLCA and Da Future Stars elected to bat. After the first couple of overs, the game was reminiscent of the Boxing Day test at the MCG due to the slow wicket. Cameron Laird opened the bowling with the Dukes ball and offered some variety early. However as the first session dragged on, it was apparent that it was a batting wicket that offered little for the bowlers. Billy Buckingham began to take control from one end, however no wickets prevailed. Ned Dunning was leaking runs with his right arm off spin, however in a miraculous turn of events, this became redundant. A component of spending a summer away in Australia for these young Englishmen is to adapt to situations and explore new opportunities outside of their home environment. Ned Dunning returned to the crease. Right arm over the wicket exclaimed the umpire. However, this was looking a little different with Dunning at a fast bowlers run up. Whilst it took a few overs to eventuate, a miracle was born. Dunning had successfully turned himself into a medium-fast seamer without practice to scalp 4/64 from the innings. Amazed teammates could not believe it. With the excitement of Dunning’s revelation in the field, the extremely hot day of 38 degrees only turned warmer. It was a testing day in the field as Ben Bryant from North Sydney District Cricket Club scored 204 for Da Future Stars. The day eventually came to a close with the opposition declaring on 7/535. A mighty fine effort from a squad that appeared very well-rounded. The players all needed to hydrate overnight as the temperature on Wednesday 23rd was sitting at 40 degrees. It appeared that Day 3 would be called off due to extreme temperatures of 46 degrees, meaning the DLCA had to use the day to best effect. The chase was off to a slow start with early wickets falling from Charles Clist and Billy Buckingham. However Alex Eckland and Mahaaz Ahmed came to the crease and steadied the ship with an important partnership to get the DLCA back in the game. Eckland was politely knocking the away teams fast bowlers around the field, starting to establish a good long-form innings. Ahmed remained at the crease, executing a couple of nice sweep shots to help Eckland reach 41, his high score for the season so far. Going into lunch the DLCA were 2/94 and Mark Harrity encouraged the boys to keep at it and look to close out the day. Unfortunately in the first ball back from lunch, Ahmed played one too many sweep shots and was caught at short fine leg. Joining Eckland at the crease was childhood friend Ned Dunning after an excellent performance with the ball. Just as Dunning looked steady, Eckland was out. Joining Dunning at the crease was Olly Nathanson – so dedicated to his studies that he is currently completing Upper Sixth Form whilst attending the DLCA. Nathanson spent the entire game with his his french and physics textbooks at the table whenever he was not required in the match. The two steadily reached a composed 175 partnership, with Nathanson knocking up a beautiful 105 not out, his best score in Australia against arguably the most difficult opposition. Dunning also scored a career best 54, displaying his prowess as a genuine allrounder. However, the DLCA experienced a lower order collapse and finished up on a commendable total of 345, with Da Future Stars running away with the win. Day 3 was inevitably cancelled due to forecasted temperatures of 46 degrees and the two squads had a day off to recover at the beach. Head Coach Mark Harrity reflected on a strong week of cricket stating, “the modern cricketer has more challenges than ever, guys need to adapt between the different formats of cricket”. Thank you to the umpires for a great week in the scorching conditions and we look forward to playing Da Future Stars next year!